Swift Home Duvet Cover & Sham Set has a soft hand for a beautiful bedroom addition. Slide your comforter inside and use the easy-to-secure zipper closure to keep it in place. This set offers a variety of colors to match any bedroom. Cotton is a pure, natural material, and this means that when woven into bedding set it makes the fabric breathable. Cotton will absorb the heat from your body throughout the night, allowing you to stay cool and dry. Always wash cotton bedding alone. Not only will the bedding get a better wash, you'll save overloading your machine too. Twin/Twin XL measures 68 by 90-inch, 1 standard sham 20 by 26-inch. Sham with 2" flange. Full/Queen measures 90 by 90-inch, 2 standard shams 20 by 26-inch. Shams with 2" flange. King/California King measures 106 by 92-inch, 2 king shams 20 by 36-inch. Shams with 2" flange. COMFY AND BEAUTIFUL: Everyone needs comfort in life and it starts from your bedroom, specifically your bed. After a long hectic work, who wouldn't love to help their mind and body relax and rejuvenate every day after work?! Your bed should be equal parts comfy and beautiful. Swift Home's highly durable and stylish Chambray Duvet Cover & Sham combines classic character with relaxed elegance for the bed. It is washed for a luxe. PREMIUM QUALITY: Pure Cotton yarn dyed washed chambray for vibrant and lasting color. Colored and white threads weave a weighty fabric that's soft-washed for a comfy "worn-in" feel. 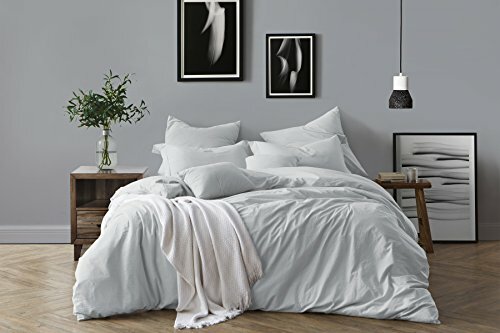 BEAUTIFUL WRINKLED DUVET COVER & SHAM: Duvet cover has a hidden zipper closure and interior ties to keep your insert in place. Finish the look with matching shams. Delightfully crinkly bed linen that won't fade. You don't have to worry about it wrinkling because it's supposed to be wrinkled! Packaged in matching fabric with ric-Rac and one button closure. Great gift idea! Surprise your friends and family with these beautiful and amazingly soft Cotton Duvet Cover sets. CLASSIC COLORS: Available in a variety of 6 beautiful colors: Ivory, Almond, Pale Blue, Dusty Lavender, Ash Grey and Chambray Blue. AVAILABLE SIZES: Available in Twin/Twin XL, Full/Queen, and King/California King. Guaranteed to fit your US size comforter and pillows. Twin/Twin X-Long measures 68 by 90-inch, 1 standard sham 20 by 26-inch. Full/Queen measures 90 by 90-inch, 2 standard shams 20 by 26-inch. King/California King measures 106 by 92-inch, 2 king shams 20 by 36-inch. Shams with 2" flange.